Nose: The nose starts off with smoke and peaty flavours, gauze bandage and a nice maritime edge. Behind that, sweet notes of barley sugar and a hint of citric fruits arrive, followed by a touch of iodine and seaweed in the back. Quite fresh and appealing. Palate: Surprisingly sweet and fruity start on the palate with barley sugar, lemons and tangerines. This is accompanied by a significant amount of peat and subtle smoke. Slightly warming spiciness of pepper, oak, cloves, allspice and tender nutmeg. The peppery notes increase with every sip. Nicely mouthfilling. Finish: The finish is long, sweet and warm with malted barley, smoke and medicinal flavours, followed by a hint of cloves and a briny edge on the tail. With water: Water brings more barley sugar and cereal notes to the fore. Still peaty and tangy with medicinal flavours while the smokiness is significantly tamed. Intense and warming spices dominate on the palate with cracked black pepper, cloves, and oak. Still peaty with a medicinal touch of gauze bandage and iodine. Behind that fruity notes of lemons and tangerines show up. The finish stays long, warm and subtle sweet with drying spices dominating on the tail. Comments: This first peaty expression of the Speyside distillery is a young but quite drinkable and pleasant dram. Nice balance of medicinal, tangy, sweet and fruity flavours. Elegant and smoky with a lively minerality. 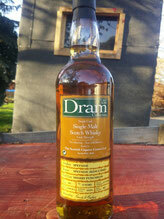 A light and fresh every day dram! Nose: Fruity start on the nose, but a bit austere rather than sweet with tangerine skins and dry apricots. Notes of vanilla and butterscotch arrive complemented by subtle marzipan, soft spice and a whiff of oak. Palate: Rich and powerful. Sweet barley and butterscotch nicely intermingle with an intensive load of warming spices - pepper, oak, ginger and a touch of cinnamon. Once the warmth's fading away, delicate notes of toffee and acacia honey, mixed with orange fruit linger towards the finish. Finish: The finish is long, sweet and creamy with sticky honey and caramel. Becomes drier on the tail with soft oak and delicate nutty flavours. With water: There's more malty sweetness coming through on the nose with a few drops of water. Delicate fruity notes of apricots and oranges are accompanied by toffee and butterscotch flavours. The spiciness is a bit tamed with water bringing more fruit and lovely milk chocolate to the fore. The finish is medium long, creamy and sticky sweet with honey and slightly warming oak. 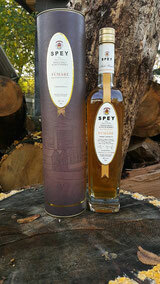 Comments: A delicate, sweet and malty Speyside whisky with a good balance of fruitiness and warming spiciness. Rich and round with a certain level of complexity. Good stuff to be enjoyed either neat or with a splash of water on a cold winter's day. Nose: Sweet and fruity on the nose. Ripe peaches, mixed with dried apricots and overripe oranges. Subtle malty flavours emerge with breakfast cereals, a whiff of vanilla, slightly floral and waxy notes. Very appealing! Palate: The sherry is more prevalent on the palate. Sweet with sticky fruity flavours of ripe peaches, apricots and mango. This is immediately followed by a warming load of delicate spices - oak, ginger, cinnamon and white pepper. A touch of slightly bitter walnut flavours arrives with subtle earthy and spicy notes towards the finish. Finish: The finish is medium long and sweet with apricot jam and stewed apples. Becomes dry and slightly bitter on the tail with oak and walnuts. With water: Water significantly tames the delicate fruitiness on the nose which releases only a whiff of vanilla and malty flavours. The fruitiness' almost gone on the palate with a remaining part of slightly warm spices and subtle vanilla. The finish is quite short, subtle warm with a hint of oak. Comments: A clean and well crafted single malt with a gorgeous nose and a delicate sweet and fruity palate. Easy to drink, not really complex with a relatively one-dimensional finish. A delicate all-day dram, however, not at this inflated price. Be very careful with the add of water as the whisky is almost masked by a few drops. Nose: Fresh on the nose with luscious red fruit, cherries, red berries, baked apples, and juicy red currants. Delicate aromas of port wine mingle with pear and vanilla cream in the back. Fruity, sweet, fresh and very appealing! Palate: Smooth and discreet on the palate. Sweet red fruit, cherries, and candy-like aromas nicely intermingle with an intense spiciness of oak, cinnamon, ginger and pepper. Lovely warm and fruity with tender honey. Slightly drying towards the finish. Finish: The finish is medium long and deliciously sweet with sticky honey and stewed red fruit. Becomes very dry on the tail with oak and subtle cloves. With water: Clean and fresh on the nose with water bringing more flavours of red fruit salad to the fore. Ripe banana and custard in the back. Lots of luscious fruit on the palate with cherry, orange, banana and pear, followed by a slightly tamed spiciness of oak, cloves and pepper. The finish is medium long, sweet with sticky fruit. Slightly drying aftertaste with oak and cinnamon. Comments: This is a lovely and very savoury dram! The 6-month port finish adds pleasant and vibrant aromas of red fruits giving this young malt richness, depth and a remarkable character. The sweetness and fruitiness is well balanced with the spiciness of the oak. Nothing's dominant here. A superb choice as an aperitif for a good meal, and, by the way, a good value for the money! Nose: A pleasant nose with vanilla sweetness, toffee and butterscotch. A whiff of lemon emerges with luscious oranges and creamy fruits - pears, gooseberries and carambola. Honey, mixed with subtle waxy notes and a whiff of cinnamon in the back. Needs a long time to develop its full aroma. Palate: Very smooth and pleasantly sweet on the palate with vanilla custard and a delicate mix of ripe tropical fruits - apricots, peaches and a touch of pineapples. This is accompanied by a lingering warmth of pepper, cloves, cinnamon and spiced oak. The spiciness becomes bigger with the next sip, followed by a gentle bitterness of orange peel towards the finish. Finish: The finish is medium long and deliciously sweet with subtle chocolate and a significantly spicy edge. With water: Clean and fresh on the nose with water bringing more flavours of delicious fruit salad to the fore. Vanilla cream and subtle chocolate in the back. The fruitiness' a bit tamed with water. Bitter notes of orange peel counter the honey and vanilla sweetness, taming the warm spiciness. The finish is a medium long and slightly sweet with sticky yellow fruit jam on the tongue, followed by slightly warm spices on the tail. Comments: This is a very pleasant dram! It needs a long time in the glass to develop its lingering fruitiness, vanilla sweetness and warming spiciness. 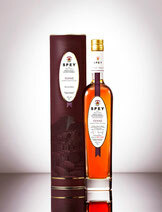 In total a very attractive and classic Speyside whisky. However, I have to admit that the price for an 18 years old is quite high. But if you have the chance to taste a sample - I highly recommend to do so! Nose: The nose starts off with a pungent alcohol smell, which is not unexpected due to its high abv. Behind that fresh fruity notes emerge with apples, melons and a hint of lemon. Gentle vanilla arrives with a touch of butterscotch and roasted bread. Water may help to open up this beast. Palate: Boy, this is what I don't call a conservative start on the palate! Bold, intense, even brutal with massive alcohol. There's a malty sweetness coming through with a slighly touch of bitter fruit, maybe lemon or grapefruit, complemented by massive spice with green oak, white pepper and tannins. Lingering floral and heathery notes fade with damp wood towards the finish. Finish: The finish shows a medium length of sweet and flowery notes. Very warm with a delicate sticky honeyd film on the tongue. With water: Definitely there is an urgent need for (a fairly amount of) water here. 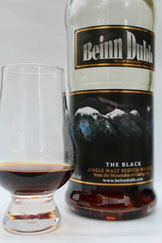 It opens the malt with more fruit, especially oranges, vanilla and pleasant toffee on the nose. Still bold and intense on the palate but with a delicate creamy sweetness of barley sugar, pleasant fruit and a whiff of bitter notes. The finish is medium long with stewed fruit and an incresed bitterness of green wood, leading to a somewhat sopanaceous end. Comments: This old whisky is a very challenging one. It definitely needs a fairly amount of water to detect the sophisticated flavours behind this thick alcoholic wall. The sherry influence wasn't obvious to me, but this puncheon released a delicate sweetness and fruitiness, balanced with a huge amount of warm spice. The indefinable soapy note on the finish, however, induces me to avoid (too much) water. Colour: Deep mahogany (almost black). Nose: Rich and intense with dried fruits - dark cherries, sultanas, raisins - that open up in layers. This is complemented by a touch of roasted oak flavours, such as caramell. Pleasant alcohol on the nose with demerara sugar and some herbal notes in the back. Under the big fruitiness there is a whiff of nutty flavours and lingering oak spice. Palate: Sweet and creamy with dominating dried fruits again, treacle, molasses and a slightly bitter note of black currants as well. This is followed by a warming spiciness of oak, pepper and herbal notes. Sticky dark honey arrives together with rich black chocolate and lingering cinnamon. Nicely mouth-coating. Finish: A medium to long finish. Rich, sweet and warm with dark stewed fruits and a slightly bitterness. Delicious dark honey sticks on the tongue while lingering coffee notes and oak spice lead to a dry end. With water: Fresher on the nose, but stays sweet with some additional herbal notes and lingering malty flavours. Rich and sweet on the palate with an increasing hot spiciness and prickling oak. Medium length finish with a bitter sweet aroma of honey, coffee, spice and dry oak. Comments: A sweet and satisfying malt with a bit of heat in it. Nicely balanced with delicate dried fruits, delicious treacle honey and a lingering coffee-ish roastiness. Not very complex, but intensely flavoured and pleasant to drink.